The likelihood is strong that parts of books would be omitted by the hackish use of utilities to extract browser viewable html from mobi files. While the head/tail procedure could be refined to produce better results, and there may be conversion programs available already, I’m heavily inclined to forego such an approach, and just use the Kindle viewer. Currently, that means I’ll be using Windows in combination with the Amazon provided PC reader software, or a hand held ebook reader such as Kindle Fire to read Kindle formatted ebooks. I will say that the Kindle PC emulated reader software is nice, and lets you adjust the screen to effect the look of various Amazon bookreader models. For ePub books, there are a limited number of Linux based dedicated ebook readers available, including the Lucidor package. I cannot vouch for Lucidor, but am told it works well. For me, something about the package invoked a negative sense and a disinclination to use it. Maybe it was because I seemed not to find the source package to go along with it … and maybe it was because the reader came pre-loaded with the Communist Manifesto. Apparently, Lucidor uses Xulrunner (a browser oriented system) on the back-end, in order to perform markup language parsing. Due to a need to parse markup, most native environments that historically would have been used for native dedicated ebook viewer software turn out to be not particularly well suited to the task. For this and other reasons, in the free/open-source world, I believe the best bet for reader software is simply to pick a browser with an appropriate extension. Otherwise, I think one should buy a handheld reader. Microsoft always has a horse in the race, but not always one that’s winning, placing, or showing. I’m not a Microsoft hater. In some ways, they are all that remains in the world of entrepreneurial software. But the Microsoft entry in the ebook race seems far behind. The typical way to read Microsoft lit files is to purchase a Microsoft hand held ebook reader, or to use a MS Word addon product. The last time I used it, the MS Word addon ebook package was being distributed for free. It works well, and it can be used to create MS “lit” formatted ebooks. An affiliated PC based reader was at one time available from Microsoft, for free. As I recall, it worked very well. Microsoft’s announcement (August 2012) that they were discontinuing the “lit” format, and the associated reader software may account for the fact that clicking the referenced link prompts an error. Interestingly, Amazon provides a Linux utility for creating mobi (Kindle) books, but not for reading them. Thus – denizens of free software and operating systems are more likely to buy the mobile devices. Many open source aficionados loathe the use of Windows. Guess that’s the plan, and perhaps a good one for Amazon – how else to they make a profit? 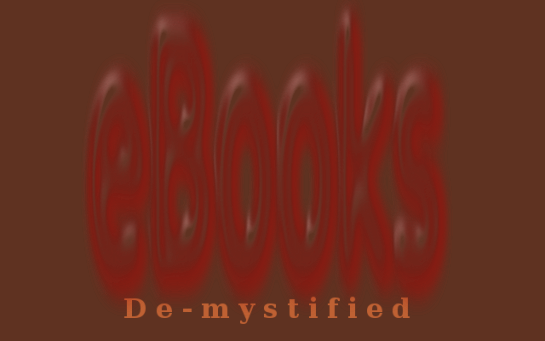 There are quite a few options for writing ebooks with free software.